The journey on The Road to the World Car continues with the recent announcement of the finalists in all five award categories. This release kicks off the countdown for the 2015 World Car Awards (the WCAs) prize-giving ceremony to be hosted by the New York International Auto Show (NYIAS), Bridgestone Corporation and Autoneum on Thursday, 2 April, 2015. Winners of the 2015 World Car of the Year, World Luxury Car, World Performance Car, World Green Car and World Car Design of the Year will all be declared at this time. A jury of 75 distinguished international automotive journalists selected the following finalists in the World Car of the Year, World Luxury Car and World Performance Car categories by secret ballot, based on their experience with each candidate as part of their professional work. The international accounting firm KPMG tabulated the jurors’ ballots and announced the finalists on the evening of February 9. The five experts on the advisory panel are in alphabetical order: Phil Berg (USA - PopularMechanics.com); Richard Bremner (UK - Autocar magazine), Claus-Peter Koeth (Germany - automobil-industrie.de); Yumi Kawabata (Japan - environmental journalist) and John Voelcker (USA - GreenCarReports.com). Cars eligible for the 2015 World Car Design of the Year award are taken from the list of World Car candidates or may be included as a stand-alone entry provided the vehicle is available in quantities of at least 10 in one major market during the period beginning January 1, 2014 and ending May 31, 2015. Candidates may be pre-production or all-new production. Again, a design panel consisting of five highly respected world design experts was asked to first review each candidate, then establish a short-list of recommendations for the jurors. The design experts are: Masatsugu Arimoto (Japan – Freelance design journalist); Silvia Baruffaldi (Italy – Auto & Design magazine); Gernot Bracht (Germany – Pforzheim Design School); Sam Livingstone (UK - Car Design Research and Royal College of Art) and Tom Matano (USA - School of Industrial Design at Academy of Art University in San Francisco). 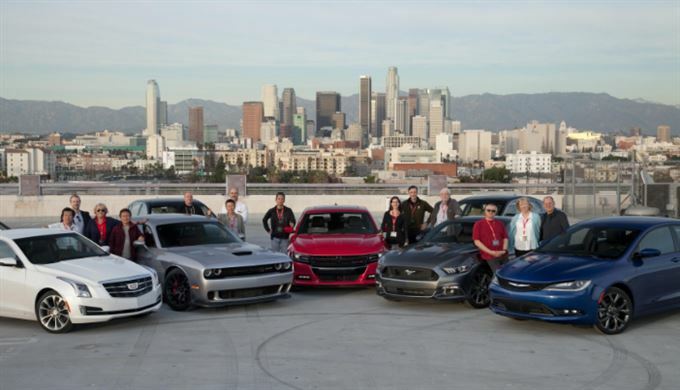 The Road to the World Car began in Paris on October 2, followed by a stop in Los Angeles for a test-drive of the North American contenders in November, and continues with the finalists’ announcement. The next stop is at the Geneva International Auto Show on Tuesday, March 3 when the top three finalists in all categories will be announced. The journey ends at the New York International Auto Show on Thursday, April 2nd, 2015 when all winners are declared.